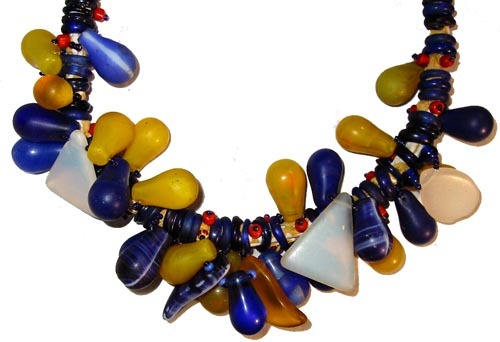 “Mali Mali” Necklace: A Bold and Colorful Ethnic Necklace of Vintage Beads. 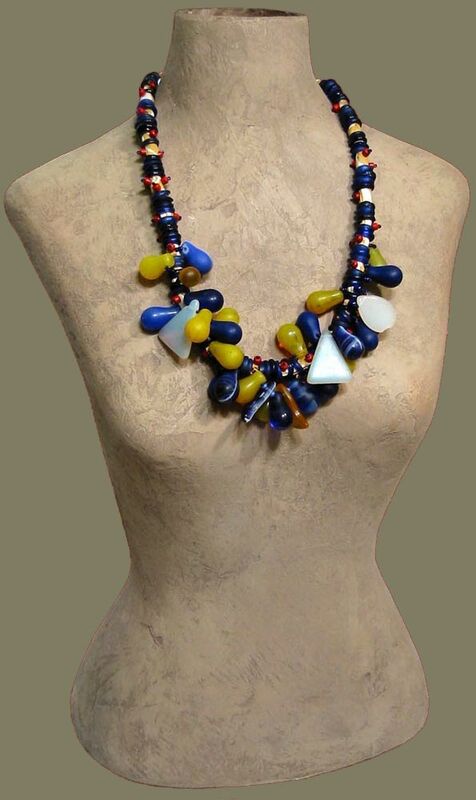 This Handmade Necklace Displays Blue and Yellow Trade Beads With White and Coral Colored Beads and Seed Beads as Accents. Each Bead is Either Hand-Sewn or Hand-Strung Over a Rope of Italian Fortuny Fabric. This Chunky Necklace is Fitted With a Hand-Braided Cord/Knot Closure. A Designer Necklace That is Much More Than Just a Fashion Accessory, More Than Merely Adornment. As Each Bead Tells It’s Story, It Creates a Virtual History Book of Trade, of Business and Industry, of Peoples and Their Cultures, of Fashion and Adornment. Dutch “Donut” Beads From Holland, “Wedding” Beads From Czechoslovakia, Glass Beads From Venice were Used for Barter in Africa. To Find That Beads in the Past Were Traded for Gold, for Ivory, for Palm Oil, and for Slaves is Just the Beginning of the Story. Unique Jewelry With Stories to Tell. A Fashion Accessory From Carol Tate and the Artisanaworks Studio.